Located in Emmaus, Pennsylvania, Wildlands Conservancy is a nonprofit organization protecting more than 50,000 acres of natural refuges and land easements throughout the eastern Pennsylvania region, including nine nature preserve facilities offering public and private visitor activities. Wildlands Conservancy’s origins date back to the early 1970s, when a group of eastern Pennsylvania citizens came together to implement conservation programming to preserve the region’s South Mountain ecosystem. Under the guidance of Robert Rodale, the Lehigh Valley Conservancy was formed as a land protection nonprofit organization based out of Bethlehem, Pennsylvania. In 1975, a 72-acre wildlife sanctuary was bequeathed to the organization by Air Products founder Leonard Parker Pool, which became known as the Pool Wildlife Sanctuary and became the site of the Conservancy’s offices and education headquarters. In the 1980s, the organization’s name was formally changed to the Wildlands Conservancy to reflect its expanded programming throughout the eastern Pennsylvania region, including the acquisition of eight more nature preserve facilities and more than 50,000 acres of land easements and trusts. Today, Wildlands Conservancy is operated as a nonprofit organization overseen by a board of directors, with a staff of executive managers and conservation experts overseeing individual properties managed by the organizations. As the premiere organization for environmental stewardship and land protection in the Lehigh Valley region, the Conservancy strives to raise public awareness about nature preservation throughout the eastern Pennsylvania region and preserve its natural refuge areas for generations to come. More than 70 conservation easements are owned by the Conservancy, encompassing a total land space of more than 50,000 acres of high-conservation value regions throughout the Lehigh Valley and Lehigh River watershed. Nine nature preserves are operated by the organization, totaling 2,600 acres of land preservation and offering nature activities and outdoor exploration opportunities for the Lehigh Valley community. Several sites offer open park exploration, including Burkhart Preserve, which offers hiking and mountain biking opportunities on its 34 acres of woodland trails. The 10-acre Hammonds-Keeley Preserve showcases a riverfront field and woodland habitat area for public birdwatching, while the Reimert Memorial Bird Haven provides a two-mile birdwatching trail within an 11-acre mature woodland forest site. While the 680-acre forest and thicket Maple Tract Preserve and the 1,372-acre Thomas Darling Preserve glacial wetland are open to the public, visitors should be advised that access to their grounds is difficult, though plans to create access and conservation trails have been outlined as part of the Conservancy’s future development vision. Two other facilities, Buehler Memorial Park and Freemans Island, offer visitor programming through educational programs or by special appointment for researchers. The 77-acre Pool Wildlife Sanctuary is open to the public as a nature preserve and visitor recreation area, offering seven hiking trails spanning a combined total of 2.6 miles. A 19th-century preserved farmhouse and an 1869 Pennsylvania German bank barn is located on the property, along with the Conservancy’s main offices. Trails within the preserve include the 0.4-mile Woodlands Trail, the 0.45-mile Pheasant Run Trail, the 0.68-mile Sensory Trail, and the 0.36-mile Backyard Conservation Trail. Nine miles of hiking trails are offered at the 350-acre South Mountain Preserve, including the 1.2-mile Trout Run Trail, the 1.7-mile Alpine Street Trail, and the 0.9-mile Mountain Top Trail. All trails at both facilities are accessible for hikers, runners, birdwatchers, and responsible pet owners, with facilities open from dawn to dusk under a pack-out site policy. A variety of educational programming is offered by the Conservancy, including programming serving more than 14,000 K-12 students annually throughout the Lehigh Valley region. Guided field trip opportunities are available for elementary and secondary school groups at several of the Conservancy’s reserve facilities, and college-level presentations are offered by request, with all programming tailored to meet Pennsylvania academic standards. Scouting programs are offered for Girl and Boy Scout troops, including overnight and adventure experiences, and teacher-focused workshops are presented for continuing education and professional development opportunities. More than 400 community programs are offered annually throughout the Conservancy’s facilities, including a Bike and Boat Adventure program that offers naturalist-guided presentations on land and water between May and October. Summer camps are offered for youth at sites in Bethlehem and Emmaus, encouraging young participants to engage with nature and develop conservation mindsets, and birthday party packages are available for young visitors, offering naturalist-led workshops and outdoor activity opportunities. A variety of conservation programming is conducted by the Conservancy throughout its land easements and preserves, including invasive plant community control, mine drainage remediation, and water quality improvement and stream restoration projects. 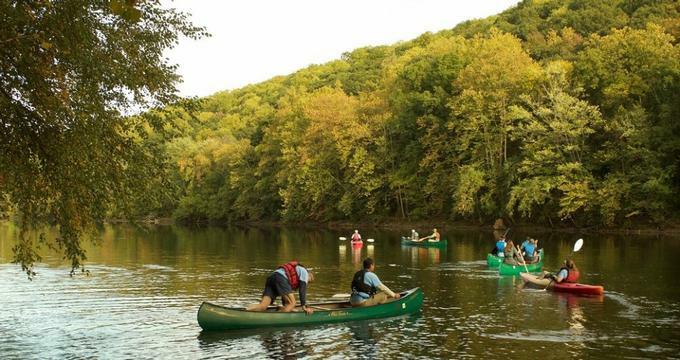 Annual public special events include a Lehigh River Sojourn, a Get Out Lehigh Valley health partnership program, a Wine and Dine Farm-to-Table dinner, and a Green Gala Dinner Auction fundraiser.